A proposed permit that would allow "incidental impacts on marine mammals" would not cover the Rim of the Pacific war games. 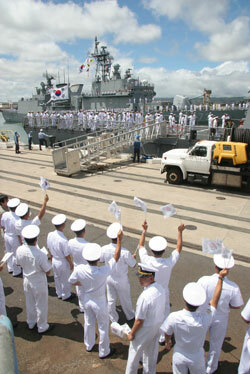 Here, South Korean warships arrived at Pearl Harbor yesterday for RIMPAC. Officers from the destroyer Lee Sun-sin greeted the warships, Munmu the Great, middle, and the Yangmanchun. The Navy is seeking a five-year permit to continue the use of mid-frequency sonar during undersea warfare exercises in Hawaiian waters after whale-protection restrictions expire in January. The public has until July 23 to comment on measures proposed by the National Oceanic and Atmospheric Agency that would allow the Navy to use mid-frequency sonar during training activities around the Hawaiian Islands. » Establish a marine mammal safety zone around any warship using sonar. That means if a whale was sighted within 3,000 feet, the vessel would be required to reduce the power of its sonar system and shut it down when the animal gets within 600 feet -- a standard initially agreed to by the Navy and NOAA in January 2007 but which has subsequently been toughened by environmental lawsuits. » Have three sailors posted as lookouts. » Establish an area of extra caution in the Maui basin because of its high density of humpback whales. A statement from National Oceanic and Atmospheric Agency said its National Marine Fisheries Service "does not expect the exercises to result in serious injury or death to marine mammals." But NOAA said it does recognize that in certain circumstances sonar has been associated with "the stranding of some marine mammals and some injury or death may occur despite the best efforts of the Navy." NOAA has proposed a permit that "allows for incidental impacts on marine mammals, including injury or death of up to 10 animals of 10 species over the five years covered by the authorization," the statement said. The permit would not cover the multinational Rim of the Pacific war games, which involve 10 countries and begin Sunday. The permit, however, would cover future RIMPAC naval exercises and two- to three-day undersea warfare exercises conducted by all Navy aircraft carrier strike groups that pass through the islands on their way to the western Pacific. The NOAA permit would be just one of the many environmental conditions the Navy is required to meet whenever it conducts sonar during training exercises here and in Southern California waters. Since January 2007, the Navy has been employing 29 protective measures, approved by the National Marine Fisheries Service as exemptions allowed under the Marine Mammal Protection Act, to minimize potential for injury to marine mammals whenever it conducts mid-frequency active sonar training in Hawaii. That agreement will expire in January. However, environmentalists here and in California have successfully waged court cases forcing the Navy to expand the safety zones around each warship using sonar. Michael Jasny, a spokesman for the Natural Resources Defense Council, said yesterday the conditions of the proposed NOAA permit are far more lax than those imposed by the federal court during the 2006 RIMPAC games. Jasny described NOAA's action "as a rubber stamp by a pressured agency of all Navy activities." He said that "between June 2006 (when the last RIMPAC naval exercises were held) and June 2008 the science has not changed. Indeed the science continues to demonstrate the impact of high intensity naval sonar on marine life. What has happened is that NOAA has rolled over in the face of a vastly more powerful agency." However, he pointed out that the Navy might be required to use the level of mid-frequency sonar no higher than 145 decibels within the shallow coastal waters off Hawaii's shorelines. That recommendation was made May 22 by state Planning Director Abbey Seth Mayer, whose office has jurisdiction over Hawaii's coastal waters, to the Pacific Fleet Environmental Office. Mayer also included all of the mitigation measures and conditions required by U.S. District Judge David Ezra, who in February limited the number of Navy undersea warfare exercises in Hawaii waters through January 2009. He also said the Navy must reduce the power of its sonar when a marine mammal is sighted within 5,000 feet, and required all warships involved in the training to have six lookouts. A Navy spokesman yesterday disagreed with the position taken by Mayer's office. "We believe it is inappropriate for the state to extend the federal court's restrictions to other exercises," said Mark Matsunaga, Pacific Fleet spokesman.